Yes, you read that right. This is the Weekend fun EARLY Edition, because I will be out of town for the next week and I certainly do not want you to miss out on these events. This show features a large variety of Farmers Market vendors from the surrounding areas, as well as arts & crafts vendors! Shakespeare in the Park will be preforming 3 different productions throughout the summer: Cymbeline, The Comedy of Errors, and The Two Gentlemen of Verona. Enjoy their lovely open air amphitheater and check out lots of really cool wares from local artists and crafters before the show and during intermission! More information about the shows and tickets can be found at their site here. "You can find an eclectic array of items at Grapevine Market, including the finest handmade jewelry, distinctive home décor, quality antiques, and more. Peruse the unique displays and indulge in something special." Woohoo, it's about time for another exciting Arts & Crafts weekend, and that's just what we have on our hands! Check out all these exciting events going on around the metroplex. "The North Texas Institute Craft Fair (or NTI Craft Fair) is a two-day art and craft fair to be held July 24 and 25, 2010, in Grapevine, Texas. The event will feature the work of many artists, crafters, and designers that hand-craft a variety of goods. There will also be a few vendors like Scentsy and Homemade Gourmet." "Craft for a Cure is open to all crafters, artists, and bakers. The show is put together by two cousins to raise money for Susan G. Komen 3 Day for the Cure. All proceeds from the booth and table fees will go towards charity, as well as any funds raised from the raffle." Do you know about a weekend event that we are missing here? Shoot me an email at dfwcraftshows@gmail.com and I will get it added asap! In a world as big as ours, it's always nice to hear all the unique ways that people stumble upon one little 'ol website like ours! Word of mouth marketing is a huge factor in how information is spread, so thank you to everyone who are going to shows and sharing information about DFW Craft Shows! And now, the winner.... Jenn Velarde! 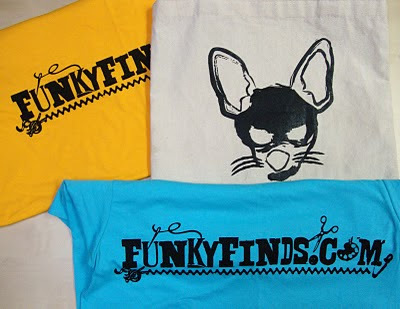 Your prize pack includes one sturdy Funky Finds tote bag and a Funky Finds t-shirt of your choice! The gold tee is loose fitting & available in Large. The blue tee is fitted & available in Medium. Congrats Jenn! Please email us at dfwcraftshows@gmail.com to collect your prize. Are you interested in sponsoring one of our giveaways and having your business listed in our blog as shown above? Email me at dfwcraftshows@gmail.com for more information! Here it is folks! If you know of an event that I am missing, please let me know at dfwcraftshows@gmail.com so I can get it added to the calendar! "The Deep Ellum Outdoor Market is a monthly event that showcases local talent and promotes local businesses in Dallas' historic arts district. The Market will provide Deep Ellum with a venue for local artists and musicians to expose their talent, for local businesses to promote their services, and for bars and restaurants in the area to entertain more people." This week's giveaway is sponsored by Funky Finds. Funky Finds offers us a number of useful resources including, but not limited to: giveaways, handmade news/events worldwide, and the perfect location to purchase and sell handmade goods! If you haven't already, I encourage you to check out The Shops @ Funky Finds for your next handmade purchase and/or as the perfect outlet to showcase and sell your own handmade goods. And, as if this isn't all enough, Funky Finds have hosted a number of arts & craft shows here locally, including the upcoming Funky Finds Experience on November 6th & 7th. They are STILL accepting vendors until August 1st, 2010, so get your applications in for this exciting event which be advertised all over the metroplex in a variety of media including 8.5" X 11" booklets. One lucky DFWCS winner will receive one sturdy Funky Finds tote bag and a Funky Finds t-shirts of their choice, a value of $25. The gold tee is loose fitting & available in Large. The blue tee is fitted & available in Medium. Contest ends at 10:00PM on Tuesday, July 20th. Winners will be announced the morning of Wednesday, July 21st, 2010. Are you interested in sponsoring one of our giveaways and having your business listed on our site as shown above? Email me at dfwcraftshows@gmail.com for more information! "The Craft Fair will be advertised in local newspapers, in the Wylie ISD newsletter, at the football game the night before, and at various local businesses. In addition, we are looking into entertainment options to attract people, which events will be booked in either the auditorium or gymnasium as appropriate." All booths come with a free table. Chairs, electricity, and lunch are available at an additional cost. Application has been uploaded here and are due by August 10th, 2010. For more information, please see their vendor letter here or contact them at whschoirboosters@gmail.com. Happy Weekend everyone! Drive safe! "It's time. The third installment of the highly anticipated annual ArtLoveMagic celebration of the creative women of Dallas has returned! girlShow has a theme every year. This year, the theme is "The Perfect 10". Through various mediums we will challenge all women to find perfection in themselves for who they are in life, not who the media and TV would have them strive to be." "This event is to assist businesses and up and coming entrepreneurs. 2nd Saturday is FREE to the public. We will have food, entertainment and events for children such as; a bounce house, snow cones, cotton candy, popcorn, face paint and much more." Thank you to everyone who took the time to introduce yourselves! It was wonderful learning a little more about all the lovely people that make up our local arts & crafts community. On a side note: I would like to apologize for the delay in getting our winner announcement out to you! As you may have already heard, I was rear-ended last week and have been ordered to take it easy and rest since. I am finally feeling better and am happy to be back! Without further ado, the winner of the giveaway is... Jess! You have won this beautiful bracelet donated by Jinda's Charm. Jinda’s Charm was started by Krista Ketsanam after she started making clothing and bows for her new baby girl in 2009! Now, she is sharing these super cute creations with us! It's always great to see local vendors taking the time to help out the community and Krista is no exception. Krista uses a portion of all sales from Jinda's Charm to make and donate hair bows for the girls at Children's Medical Center. Congrats Jess! Please email us at dfwcraftshows@gmail.com to collect your prize.